The world’s most deadly hiking trails, Huashan Trail. Do you dare to walk on it? 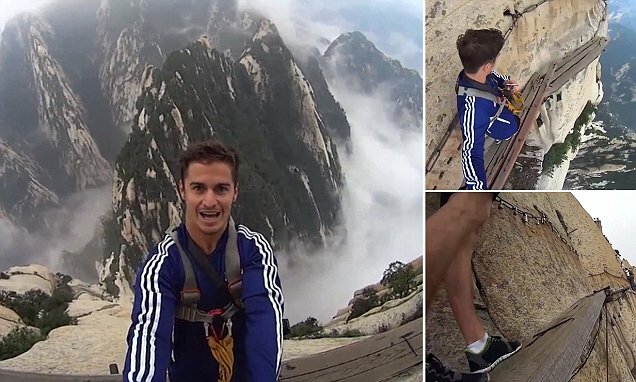 Balancing precariously on a three-foot-long wooden plank, the daring traveller pretends to step off the Cliffside Plank Path is on Mount Hua Shan in China. Wow. Great post. I would be scared to try this. I do not think that I would dare to walk on it. Yeah I do not think that I would be able to do this. Too scary for me. I will stick to safer grounds. wow! I do not like this at all! Once I was standing on the second floor of the local library and looked down from the floor to ceiling windows at the ground below and almost passed out. Seriously get anxiety attack from heights. I cannot imagine having to traverse this hiking trail. Not a happy thought!